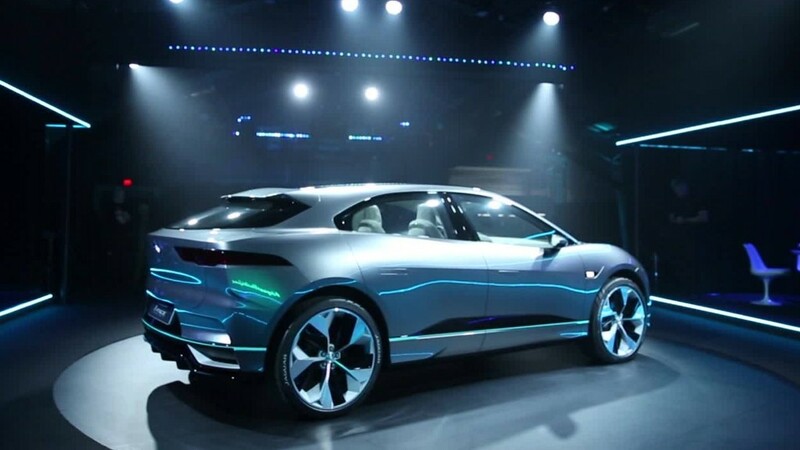 Jaguar revealed a 400 horsepower all-electric concept SUV Monday night ahead of the Los Angeles Motor Show. A production version is expected to be available some time in 2018. 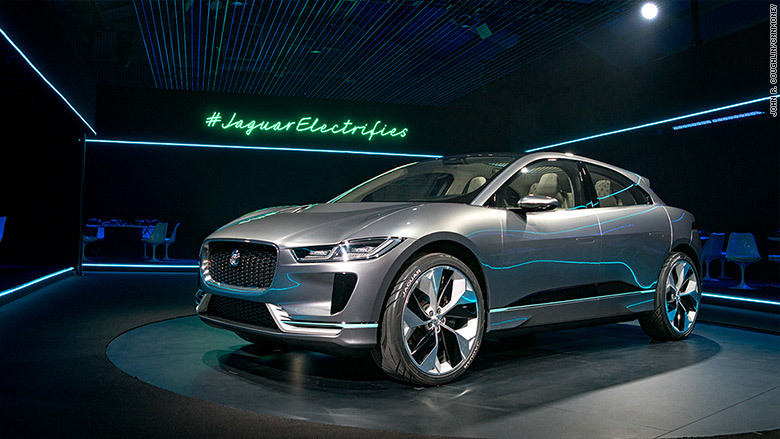 It will be Jaguar's first electric vehicle and only its second SUV ever. The all-wheel-drive I-Pace should have an EPA-estimated driving range of 220 miles, according to Jaguar Land Rover, which makes Jaguar cars. The crossover SUV was unveiled in an international press conference that included a virtual reality presentation. While reporters in both London and Los Angeles were able to see a computer-drawn virtual reality presentation, those in L.A. were presented with an actual concept vehicle driven out onto the floor among them. The I-Pace has what car designers call a "cab-forward" design with a short hood, possible because the nose of the car does not need to house a large engine. That shape allows for better aerodynamics and more interior space. 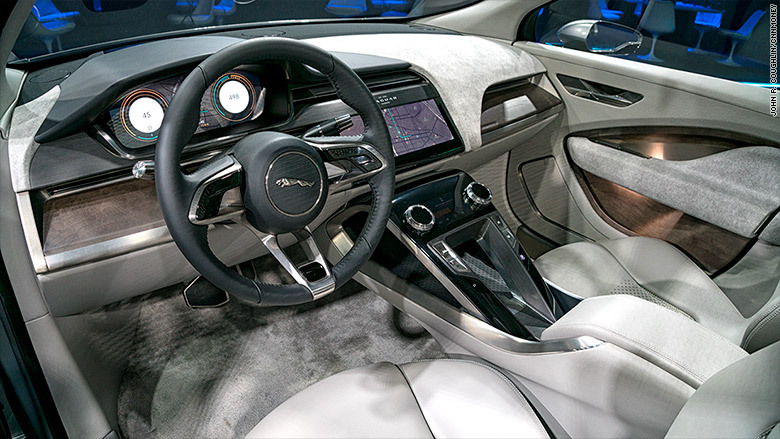 "I was determined from the very beginning of the project to create a design that reflected the mechanics of the car," Jaguar design director Ian Callum said in a statement. The vehicle's wheels are also farther out, closer to the ends of the SUV, a factor that helps improve a vehicle's driving performance. This was also dictated by the requirements of the car's large, flat battery pack, said Callum. Electric motors mounted in the front and back of the SUV produce a combined 400 horsepower and 516 foot-pounds of torque, a measure of raw pulling power. Jaguar only recently introduced its first SUV model, the Jaguar F-Pace, which has been a sales success for the brand. It became Jaguar's largest selling model shortly after going on sale. Crossover SUVs have become the hottest part of the luxury vehicle market. Overall, luxury SUVs now outsell luxury cars in the U.S., according to data from Kelley Blue Book. The I-Pace will ultimately compete with the Tesla Model X electric SUV. They're not quite in the same size class, though. The I-Pace has only two rows of seats not three. Jaguar has not announced expected pricing for the I-Pace.